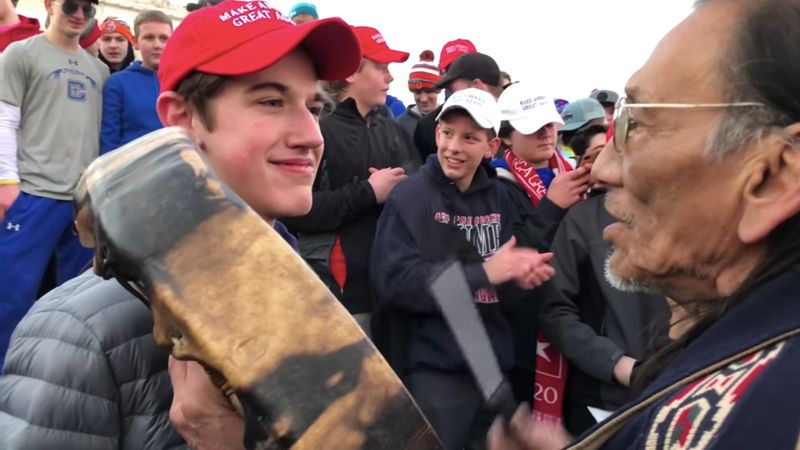 On Saturday, students from Covington Catholic were widely criticized after video was posted that showed them in MAGA hats mocking and harassing Nathan Phillips, a Native American elder. By Monday, news outlets and public figures were stumbling over themselves to claim that the initial videos were taken out of context (despite the fact that newer, longer videos showed the same thing) and that what happened with the Covington students was being misrepresented. If this sounds like a public relations miracle, it’s because the family of Covington Catholic student Nick Sandmann hired a Louisville-based public relations firm, RunSwitch PR, to help them handle the crisis, according to reporting by the Courier-Journal. Sandmann was the student in the original video of the incident that showed him standing and smirking in the face of Phillips. He released a statement on Sunday night, trying to spin the incident, claiming that he was actually the victim in the situation. RunSwitch is run by three partners, Scott Jennings, Steve Bryant, and Gary Gerdemann. According to his bio, Jennings has served in senior positions in Mitch McConnell’s re-election campaigns, as well as a senior adviser to Mitt Romney’s presidential campaign. He also worked for Jeb Bush’s presidential campaign and as special assistant to former president George W. Bush. That RunSwitch picked up Sandmann as a client is not particularly surprising. But it does make clear one thing—these students are the future of the Republican Party.